Rather than just grabbing a random pile or slowly browsing and I would advise that as you through the items on sale grab anything with potential. After you have gone through everyone on sale find yourself a space and then go through your items. Check if the zips are working, that there are no swatches of fabric cut out (these are some of the most common defects I find) etc. Have an idea of how much you want to spend- using this as your guide create mini piles from your huge pile- The No Pile, The Maybe Pile, and The Def Yes Pile. Work out how much your def pile costs all together, if over your budget cull if not then you can take stuff from your maybe pile. Keep in mind if you'll actually wear the item e.g. does it go with anything else you own or do you have an occasion to wear it. The time you get to the sale can be important. 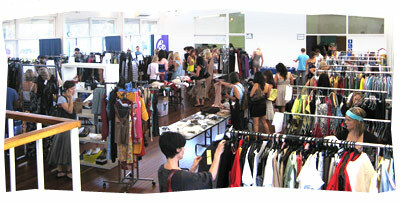 If you have a particular item/s in mind then go as close to when the sale opens are you can-the earlier the better. But if you just want bargains then going towards the end of the sale is best- as a lot of designers/stores tend to further slash their prices. Be nice. It can get a little every girl for herself sometimes but if someone comments on an item you found or is eying it appreciatively and you know there were some others left tell them where they can find it. Just want to end a post with this bad copy of a scene from Friends that goes so well this post. OMG I am sooo jealous...Did you get anything good?! And that video is perfect for this post lol! Sounds like a really fun and great sale to attend. Thank you for posting those tips! Hope you got some good things out of it! And congrats on being in the Links A La Mode! warehouse sales are the best! unless they take an evil turn... but your advice is great... to be nice ;) sometimes people just forget about everyone around them and that it's not the end of the world if they don't get a certain item!